Well I suppose it's official, summer is over. I feel like I'm still sort of waiting for the long streak of good weather to kick in...we had a few days here & there but nothing too spectacular, and I certainly don't recall any of the heatwaves we were promised at the start. Isn't that always the way?! This summer has been an interesting one for me, my first year as a mum of two children and all of the challenges that brings with it. Our beach days (and there are always many of them, living where we do!) were a little harder with Noah so tiny...trying to keep him covered and out of the sun, trying not to let him get all sandy, trying to entertain Tyne and make sure his fun wasn't compromised by us having his baby brother to fuss over and worry about, and of course trying to grow eyes in the back of my head to keep tabs on where he's running off to while also making sure Noah isn't being attacked by wasps or chewing on any foreign objects! I make it sound like a summer of beach-related nightmares but it wasn't really, all in all it was a pretty chilled Summer and the adjustment to life with two hasn't been as dramatic as I expected it to be. They say that going from one to two children is a more dramatic one than going from none to one - this fills me with hope that perhaps adding a third or even a fourth in wouldn't so bad, have I gone mental?! We'll see what happens there I think! There's been a lot of fun had over the Summer days, with some lovely and memorable trips to beautiful parts of the country including parts of Cornwall that we'd never visited before, the North East and Skegness - one of my resolutions at the start of the year was to see more of the UK and for once I feel like I've actually checked a resolution off my list, as we travelled the UK SO much already this year. Am I sorry to see Summer go? In some ways I will be - after putting loads of effort into getting our garden ready for Summer I`m sorry to say I didn't actually spend a single day out there relaxing in the sunshine like I had hoped to! But then perhaps that was a little ambitious of me, new baby taken into account and all. But if I'm totally honest, and I know people will hate me for admitting this, Summer is my least favourite of all the seasons! Sure I love the days out and having lots of daylight, but I`m actually more of a night owl - give me a starry sky and 5 minutes to stare up at the moon over the chance to sunbathe anyday!! And I'm not really a fan of warm weather - well ok I can handle it warm, but when it starts to get hot and sticky I`m out! I'd rather be freezing cold and snuggled in front of the fire under a blanket than baking hot with nothing to do about it thank you very much! Autumn and Winter are my favourite times of year, and there is so much about them I'm already looking forward to. The change in wardrobe - snuggly knit jumpers and boots over strappy revealing summer outfits and annoying flip flops anyday for me please! 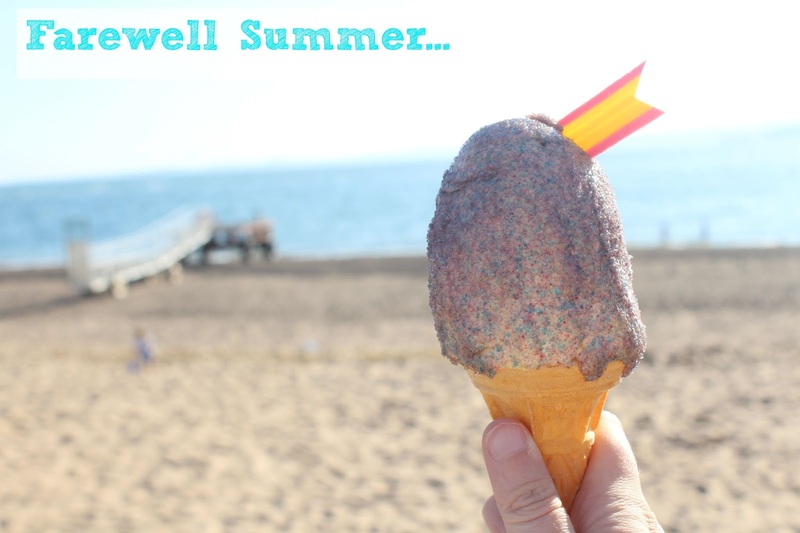 The holidays - what is there to look forward to in Summer when it comes to events?! Nothing, that's what! Once October rolls around there's Hallowe'en, Bonfire Night and of course the big ones...Christmas and New Year!! My absolute favourite times of the year are these 4 events, perhaps why I love Autumn and Winter so much. I can almost taste the candy apples and the pumpkin spice lattes...Yum!! Will you miss Summer or are you welcoming Autumn with open arms?! As always, I'd love to hear from you!